You have to eat a Puka Dog! 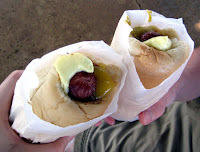 A few years ago, we visited the Puka Dog location on Kauai and everybody in my family fell instantly and deeply in love. My husband is a true blue hot dog fan and he makes the bold claim that this is the best hot dog that he has ever eaten. I have to admit that I have been a vegetarian for most of my life but even I tried and liked this delicious dog. 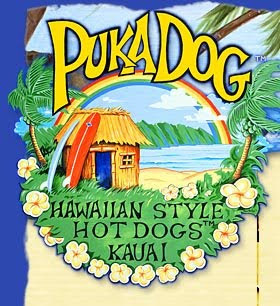 Puka Dog has two locations, one in Kauai in the Poipu Shopping Center and the other is on Oahu in the Waikiki Town Center. What makes a Puka Dog so special? Well, first the bun is made of the most scrumptious loaf that has a puka (a.k.a-hole in Hawaiian) in one end. The bun is toasted and one of 7 tropical relishes, such as Mango, is poured in. Finally the polish style hot dog is grilled and then placed in the bun. On top of this, a layer of secret lemon garlic sauce is added and the final result is amazing. This entry was posted on 9:02 AM and is filed under Hot Dogs , Kauai , Puka Dogs . You can follow any responses to this entry through the RSS 2.0 feed. You can leave a response, or trackback from your own site. Oh my my mouth is watering. I think I would make a trip to simply just taste that. This from the girl that is dying to go on a diner, drive ins and dive tour of the US. Now I'm off to convince the hubs. We will be there in just over a week!! so will definitely have to check these out. Thank you for the suggestion! omg! I love puka dogs!! My husband and I visit Hawaii every December (visiting family) and we've been to puka dogs at least 5 times!! In fact, sometimes I have a strange craving for a puka dog and have to make some of my own! Great post!! Yes..I have been there.it was great. One more thing to love Hawaii for! Thanks for introducing me to the Puka Dog. Now I have to find a way to get one pronto. Thanks for stopping by my blog and for your sweet comment. Feel free to browse backwards in my archives for more deliciousity. I love hot dogs and consider it my mention to try street food wherever I travel, but the name "Puka" is awful!! It makes me wanta... well, you get my drift! I think I'll call it a Hawaii Dog when I finally go to Hawaii!!! Thank you for all of your comments! I know what you mean, Diva, let's just not think too much about the name- Hawaii Dog sounds good too!Enjoy! LOVE LOVE LOVE THEM!! Use to summer in Hawaii, have not been back since having my little ones... this makes me homesick! !